Altermann Modern has been a great opportunity to stretch our experience into the highly competitive art world. Our task was to take the well-established brand of Altermann Galleries & Auctioneers, long since known as a premier gallery and auction house for American western and Indian art, and created a subsidiary brand in order to market their new venture into the world of modern and contemporary art. The site is high-impact with its sophisticated color-scheme and layout. 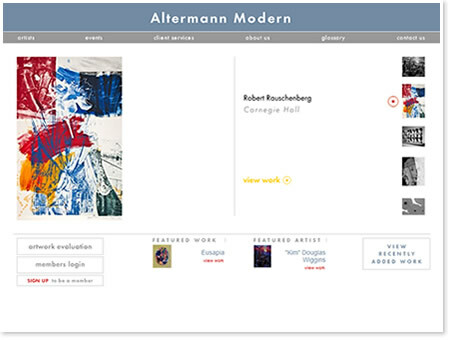 It includes a “Library” of images for significant artists and genres so that the site not only markets the inventory of Altermann Modern but is also a portal for viewing works by artists within a specific oeuvre. The site is search engine-friendly and client friendly, driving client/consignment traffic to AltermannModern.com from all over the world.